Do you receive produce in your CSA basket or from the farmer’s market and are puzzled on how to cook with them? Learn where this produce comes from and how to replenish your body by learning the skill of intuitively cooking. Join The Farm at South Mountain, Melanie Albert of Experience Nutrition and our on-site grower Maya Dailey, for a unique opportunity for a private tour of a certified organic farm followed by a hands-on demonstration of intuitively cooking a light lunch. Learn culinary skills such as making the perfect salad dressing every time, enjoy the sense of community and learn how to cook intuitively with fresh and organic ingredients from The Farm. Meet at the back of The Farm near Botanica at 10 am to promptly begin the private tour lead by Maya Dailey. 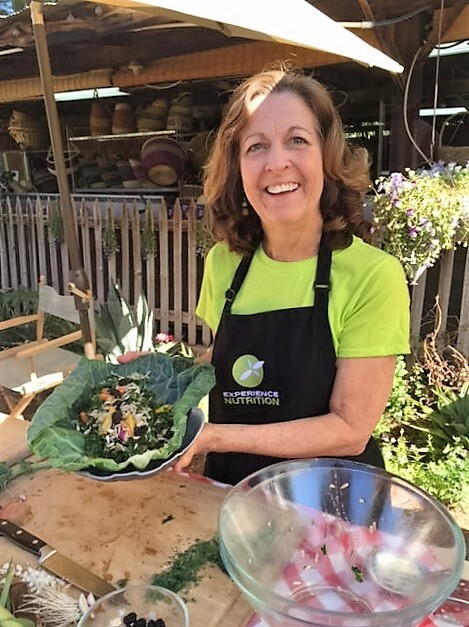 After learning the importance and philosophy of organic farming, you will be lead through the creative cooking demonstration and light lunch by Melanie Albert. 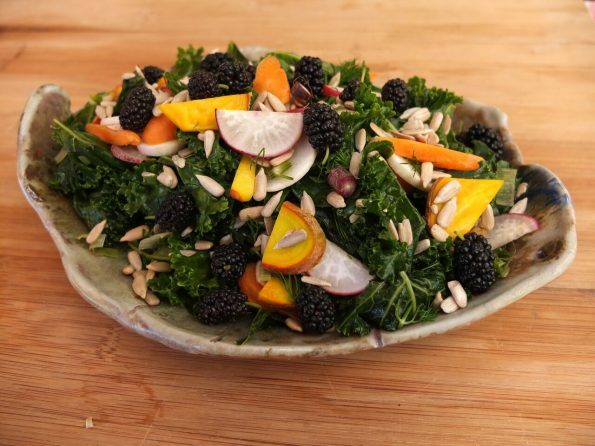 During the experience you will create a hands-on raw Kale and Fruit Salad, learn to make the perfect organic dressing, Maya’s Heirloom Tomato Gazpacho as well as Bamboo Steamer Carrots with fresh picked herbs. Refreshments will also be provided during the class. After your intuitive cooking experience, head to Maya’s Farm Stand to buy your own organic produce to take home and create more meals. The class will be held outdoors under shade. Please remember appropriate farm shoe attire and sunscreen for the best tour experience. Registration will close on Friday May 20 at 3 pm so that adequate supply counts can be made for class. For any questions, please email ashleyo@thefarmatsouthmountain.com. Melanie A. Albert, intuitive cooking expert, author, and speaker, has been active in wellness, integrative medicine, and nutrition for over 15 years. She is a 2007 graduate of the Institute for Integrative Nutrition, 2001 Integrative Medicine Fellow and 2003 Intuition Fellow of the Kaiser Institute, former marketing consultant for Weil Lifestyle, LLC / Andrew Weil, MD, Holistic Nutrition Instructor at Southwest Institute of Healing in Tempe, Arizona, and 200-hour Registered Yoga Teacher. She received culinary training with the Rouxbe Cooking School Plant-Based Professional Certification. Her company, Experience Nutrition, was an Official Health & Wellness Partner of the NFL Alumni Association in 2011. Melanie lives in Phoenix. You can always find her shopping at farmers’ markets, experimenting in the kitchen, and practicing yoga.